CLOTHING: The winter of 1916-1917 was one of the coldest winters in decades in France. Soldiers layered their clothes as much as possible. They cut open sand bags and slipped them on their feet. Socks were wrapped around their hands. 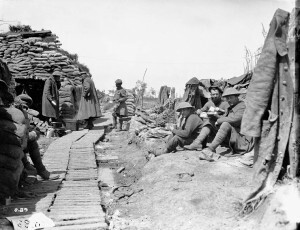 Lunch time in the trenches. June, 1916. SHELTER: Mud was everywhere. They lived in mud, slept in mud and depended on the mud. It was in their mess tins and their food. It was in their boots, the cuff of their sleeves and for the kilted units, it was frozen hard between the pleats of their kilt.Â Buried in the earth, the mud protected them from shrapnel and enemy fire. Yet the same mud gave them trench foot. It soaked through their boots, their socks, their skin and even their bones. Their feet rotted away because it. Many lost toes. WATER: There was no clean water to spare, so the soldiers seldom got to clean themselves. It may be a month or more before they get to wash. Scratching.Â Their bodies are covered in lice. Shock Troops: Canadians Fighting the Great War 1917-1918 by Tim Cook, 2008, Published by the Penguin Group. Posted in Battlefields and Military History and The Somme. For years to come after the Battle of the Somme, farmers winter yield would be a harvest of corpses. In a 19 kilometer area, where some 1.5 million men died, it is no wonder.Â From September 1916 to November 1916, Canadians fought north and south of the Somme River in France with the hopes that it would draw attention away from the Battle of Verdun. During the Battle of the Somme we suffered 24,000 casualties: 8,000 dead and 16,000 sent to the hospital. Our loses exceeded those at Verdun. Definition of “Attrition”: a wearing down to weaken or destroy, a reduction or decrease in numbers, size, or strength. 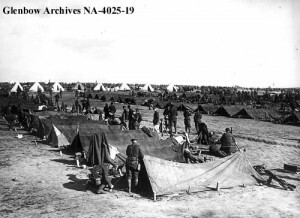 Canadian soldiers at rest behind the lines on the Somme, France. 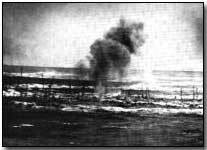 During this battle of attrition, the British suffered 19,240 dead with a total of 57,470 casualties on the first day of the battle, July 1, 1916.Â Men were killed, and new recruits came to fill in their position, who were in turn killed and replaced by another man, so on and so forth.Â Soldiers who managed to survive in the trenches of Somme became so demoralized by the death toll that they refused to make friends with any new recruits until they had survived a few weeks in the trenches (Cook, 2008: 15). We learned our lesson, that “simply adding more guns and men…was not the answer” (Cook, 2008: 25). Shock Troops: Canadians Fighting the Great War 1917-1918 by Tim Cook, 2008,Â Published by the Penguin Group. This site is officially live as of dinnertime on Sunday April 26. It’s also officially devoid of any content whatsoever. As we work to make this an interactive learning tool for our lucky students as well as a valuable resource on Canadian military history for the casual visitor, we are also going to be learning the ins and outs of web design on the WordPress platform. The process will certainly be iterative and educational on many fronts, so please excuse the work-in-progress nature of the site and come back soon as we continually grow! Posted in Dieppe and Juno Beach and the Normandy Invasion and Passchendaele and The Scheldt Estuary and the Liberation of Holland and The Somme and The Ypres Salient and Trip Planning and Vimy Ridge.